All throughout 2018 we helped to create new fun memories for our Why Me children and families, whenever possible. We hosted a few days of school vacation activities in February and again in April. We had a fun evening out with our Why Me Moms. We celebrated holidays with fun events at Easter, Halloween and Christmas. We held movie nights, games nights and attended a few sporting events in Boston and Worcester. We brought our teen population together for a few fun outings and created a new volunteer group for those that wanted to “give back”. We watched parents bravely share their journey with attendees at our fundraising events. Overall, we did what we have for the last 30+ years – stand by our families and help provide moments of joy that they will remember long after their cancer treatment. We look forward to making new memories in 2019. Andy Sharry and his family have been supporting Why Me and Sherry’s House for over a decade. He was first introduced to Why Me in 2000 when he and his father ran the Bermuda Marathon to support Why Me, specifically raising funds to build Sherry’s House. During the first couple years running for Sherry’s House, he and his family raised over $20,000 through various running and fitness events. Recently, he’s renewed for passion for supporting Why Me and Sherry’s House. In 2015 Sharry began working as the Health and Wellness Director for Worcester Fitness, where he introduced the team to Why Me. “Worcester fitness is a great fit for me. They are a pillar of the fitness community in Worcester and are very invested in giving back.” Sharry explains. 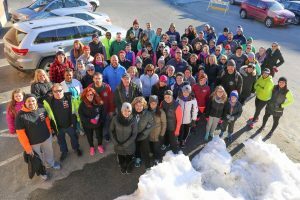 Worcester Fitness hosts many fundraising and charitable events throughout the year. As the Worcester Fitness running team coach, Sharry saw an opportunity to once again utilize his love for running to benefit Why Me. 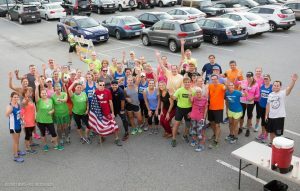 In June of 2016 Worcester Fitness hosted the first Touch the Tower event in support of Why Me. 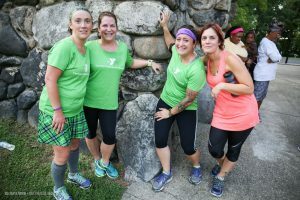 The First Wednesday of each season the gym invites running/walking groups from across Worcester to participate in a 4 mile round trek to Bancroft tower, starting at Worcester Fitness. The event is open to the public and participation at any fitness level is encouraged. “Connecting people is my passion. I really wanted to create a community event that anyone could participate in.” Sharry states. There are no time clocks and participants can run or walk. Leashed dogs and baby strollers are welcome. Sharry hopes that by keeping the event casual, with no time clock or registration fee, participants can focus on the experience rather than their time and the funds will go straight to the families who need it. In the years after their youngest daughter Sophia lost her life to cancer, the Kuczarski family has remained a part of the Why Me family, both through their participation in bereavement programming offered at the house and through an active role as fundraisers and volunteers. The family started a Kickball tournament in Sophia’s name, Kickin’ it for The Sophia FUNd, the proceeds of which have supported various Why Me families and programs. They have donated gas cards, hospital care packages, helped with funeral costs, and funded memory making activities for Why Me families. A few times a year they like to stock the Sherry’s House food pantry. 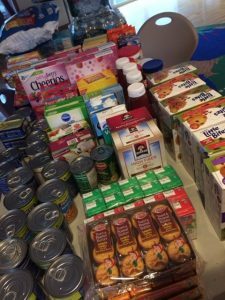 “We know what a relief that pantry can be to families who have been forced down to one income or who just can’t get to the grocery store after long days at the hospital.” Rebecca shares. This year the Kuczarski’s decided to take their giving up a notch and created the first annual Food Pantry Challenge. 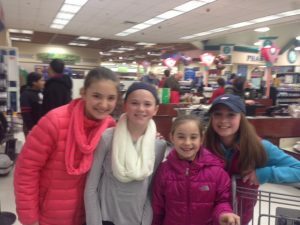 “We challenged our kids, Ethan and Hannah, to each assemble a team of friends to shop with. We gave them each a budget and set some ground rules.” The Kuczarski’s wanted to create an opportunity for their children to include their friends in the giving. “Many of the kids from school participate in the kickball tournament and we wanted to give them an opportunity to experience the house and see where their donations are going.” Eric Kuczarski adds. The teams gathered and were given 30 mins to prepare for their shopping trip. The Tweens (Hannah’s team) prepared by collecting reusable bags, saving them .05 per bag, coupons and a detailed list. The Teen Team (Ethan’s team) took a more laid back approach working off of sales in the store. Both teams were driven to their respective Price Chopper Markets, the clock was set and the shopping began! The teams chose items from the Sherry’s House pantry WISH LIST and were awarded extra points for high need items. They had 1 hour to shop and were deducted points if they were not in line by the buzzer. With a gentle reminder over the grocery store loudspeaker “Attention Sophia Fund Shoppers this is your 5 min warning.” both teams made it to the checkout in time! The Kuczarski’s invited the kids living in the house to participate in the judging process. The Tweens won, 101 to 80, thanks to their careful planning and secret cost saving strategies. The first place winning was a day at Sky Zone. The runners up walked away with a pizza party. Both teams were prized with new friends and lasting memories. “It was great to fill the pantry, but this time was different. 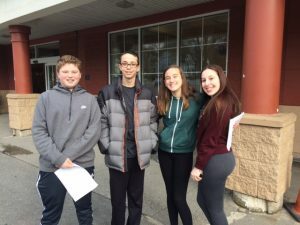 Having all of the kids, my kids, their friends and the kids at the house, working together and having fun together made a lasting impact on them.” Rebecca goes on to explain that this experience also helped to normalize cancer and Sherry’s House for Ethan and Hannah’s friends, which is important to them as a family as they continue to navigate life without Sophia. 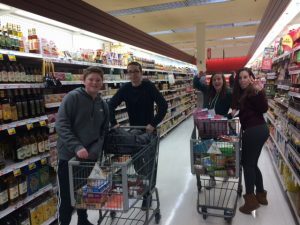 The Kuczarski’s say they look forward to the next Food Pantry Challenge where they will invite new friends to participate and continue to spread awareness of the needs of the house.